I did not have any fruit pectin, which many of the recipes called for, but I did have a small box of raspberry jello! So using this recipe as a model, I made up my own jam recipe from all the strawberries and rhubarb I had prepared! 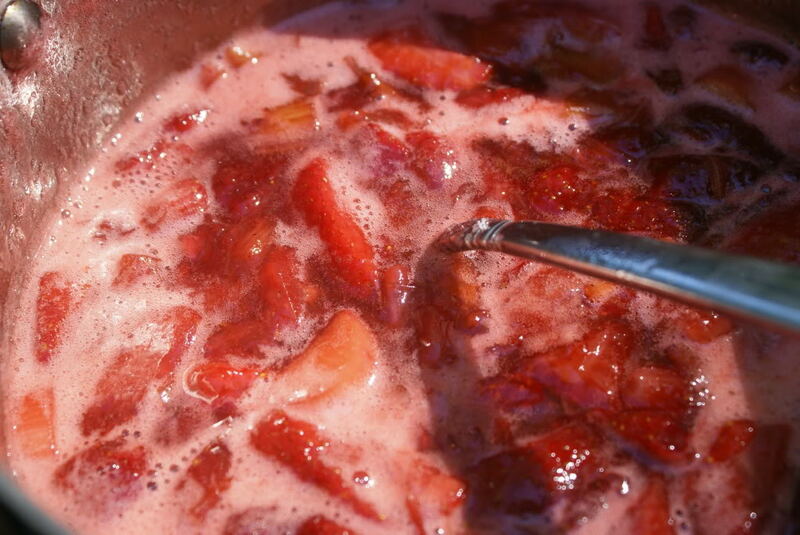 In saucepan, combine diced strawberries and rhubarb pieces with 2 cups of sugar. Let sit for at least 20 minutes, allowing time for sugar to draw out the juices. Once juices have appeared in the saucepan, bring to a boil. Stir often. Boil for about 10 minutes, or until rhubarbs have softened. Reduce heat and let bubble. Add jello packet and stir continuously until the jello dissolves. Remove from heat, let saucepan cool, then place in refrigerator for at least 2 hours. Jam will thicken. Place in Mason jars. Jam will last one month in fridge. Put in the freezer if you don’t think you will use it all within a month.